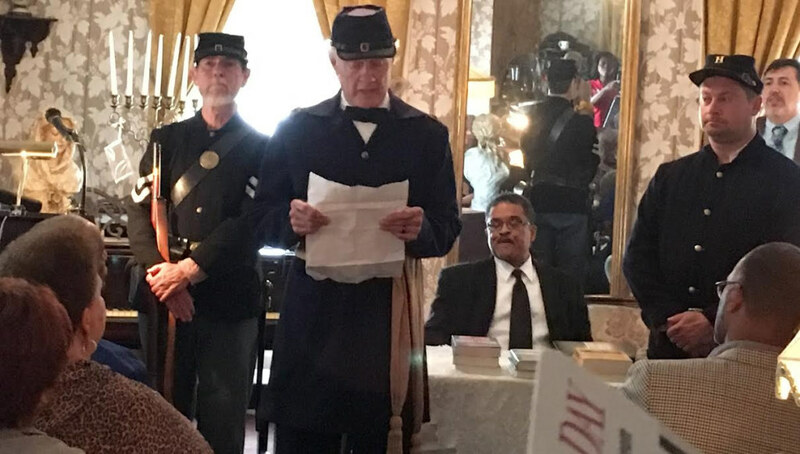 Brian Bibeau, second left, reads the Emancipation Proclamation in a portrayal of Union Brigadier General Edward M. McCook. 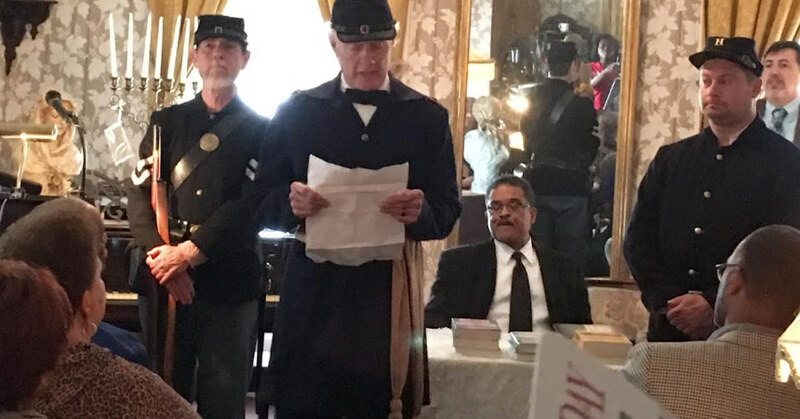 Thunder, lightning and rain could not stop spectators from crowding inside the Knott House Museum to celebrate Emancipation Day this past Friday. The original proclamation was read on the steps of the Knott House on May 20, 1865 by McCook. In recent years, Tallahassee has celebrated the significance of the occasion. While it is a momentous occasion for Blacks, it also marks the beginning of the journey towards freedom. “It also called attention to the end of the (Civil) war and one thing I think we need to understand clearly was that the Emancipation Proclamation was a good start towards guarantying the freedom of Black Floridians but that it took the amendment to the constitution to guarantee that permanent freedom,” said Rivers. The event traditionally attracts crowds as huge as 700 people. However, the inclement weather reduced the crowd to about 160, the smallest that Beatrice Cotellis has seen in 13 years as manager at the Knott House Museum. However, the small crowd didn’t have dampened spirits. “We are very happy to be here recognizing this important event, considering the rain we had some die heart supporters to come out,” Cotellis said. Clara Jackson made the trip from St. Petersburg and said it was worth the trip despite the poor weather conditions. The Tallahassee stop was part of a historic tour of several South Florida cities.